The Wool Exchange, 1896. Later the American Thread Building. Listed on the National Register of Historic Places, the eleven story building at 260 West Broadway was built by the New York Wool Warehouse Company as the New York Wool Exchange in 1894-1896. Designed by William B. Tubby in the Renaissance revival style, the building was advanced in the simplicity of its overall design. The Wool Warehouse Company, a business venture by a group of wool men, sought to create not only a building exclusively for the wool trades but also an actual trading organization, the Wool Exchange, with the intent of wresting control of the wool trade from Boston. Both the Wool Warehouse and company and the bank that supported it failed in 1898. In 1907, the American Thread Company occupied the building and since the 1920’s the building has been known as the American Thread Building. 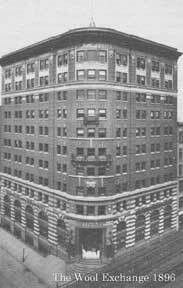 The building was later converted to residential and commercial condominiums in the early 1980s. Today its impressive, broad facades curving from Beach Street into West Broadway make the former New York Wool Exchange a distinguished downtown landmark fronting Tribeca Park. In 2012 Air Ideal Inc. had been the HVAC contracting company that had been providing service and maintenance for the existing cooling tower and condenser water system that served the commercial offices and some of the residential spaces in the building. After the system reached its life expectancy it was struggling with water quality, pipe integrity and chemical treatment issues. John Ottaviano, Air Ideal’s President, recommended that the old water cooled system be replaced with a new VRF system. A VRF system was presented as the ideal solution because of the long refrigerant line runs required throughout the building and because one of the building’s priorities was to have all outdoor equipment located on the roof of the 11 story building. The building board also wanted to have the capability of billing condominium owners for their individual electric power consumption based upon usage. The board requested a system that could be expanded as more owners decided that they wanted HVAC systems and better environmental control that would enhance their residential resale values. As the building is located in a very busy area in Tribeca in lower Manhattan, Air Ideal also wanted to have the ability to provide a remote monitoring capability that would allow it to view any problems that might be corrected without dispatching service technicians to diagnose the issues. Individual condominium owners wanted the ability to select indoor units that could satisfy a multitude of different applications since each loft style condominium is unique in size, layout and design. Mitsubishi City-Multi was presented to the board as the product that had the flexibility to meet these unique criteria. Subsequently, New York City developed stringent inspection and cleaning requirements for all cooling towers because of the recent legionella outbreak and the elimination of the cooling tower became a major benefit for the building leadership, its liability and its residents’ health concerns. Replacement of the existing cooling tower and the condenser water risers had been a consideration, but the costs for such far exceeded that of the ultimate solution. After much consideration, the board selected Air Ideal’s proposal for the Mitsubishi City-Multi System with Phase I consisting of 94 ton of outdoor equipment and 102 tons of indoor equipment (43 units). The control system would consist of an AE-200A central controller with electronic sub-meters and AG-2000 software for tenant billing and monitoring capability. As the building did not require simultaneous heating and cooling (there was a building hydronic heating system to remain), the Y series was selected to reduce the overall project costs. The project would become a collaborative effort between Air Ideal, the building’s leadership and staff, individual condominium owners, the building management company (Orsid Realty) and the project managers (IP Group and Jonathan Rose Associates). The project was started in December, 2014 and completed in August of 2015. The system has been operating without service issue to date and the building is happy enough with the outcome that there is a desire to expand the system with capacity to potentially encompass the entire building (A proposed Phase II would add approximately 81 tons). As always, to keep up to date with what’s new in HVAC technology, visit our website at airideal.com and follow us on Twitter @airideal and at our Facebook page!